This week’s Walking Wednesday post is from Alexis Dimyan, who we discovered through our Facebook page, he is a regular contributor and we greatly appreciate his input! This walk will certainly get the juices flowing, climbing two hills (hence the name altitude) but as with climbing any notable peaks in these parts, the vistas are truly spectacular. Allow yourself 6 hours to complete, which includes regular stops for photography, refreshment and a picnic by Langorse Lake (which is the halfway point). Turn left next to the Star Bunkhouse and head up towards Penuel Baptist Chapel. Walk around left side of chapel, go through kissing gate and continue upwards on path until you reach a road. Turn right and shortly afterwards head left up a lane, heading towards a white cottage. Go through a gate above it, following the track up beside stone wall to ridge above. This will take you to a wide, clear, and straight track that follows the fence and wall up on to Mynydd Llangorse. After this fairly rigorous ascent, you will now reap the benefits with glorious views everywhere you look: to the West, Llangorse Lake (the largest natural lake in South Wales), to the East, dramatic views of notable peaks in the Black Mountains (Sugar Loaf, Table Mountain, Pen Cerrig-Calch, Pen Allt-Mawr, Pen y Gadair Fawr, Waun Fach). This isn’t even the best viewing spot on the walk. As you head over Mynydd Langorse, you will cross a path from your right (this is the path of the long distance trail traversing the National Park, 100 miles in 8 days and strongly recommended! 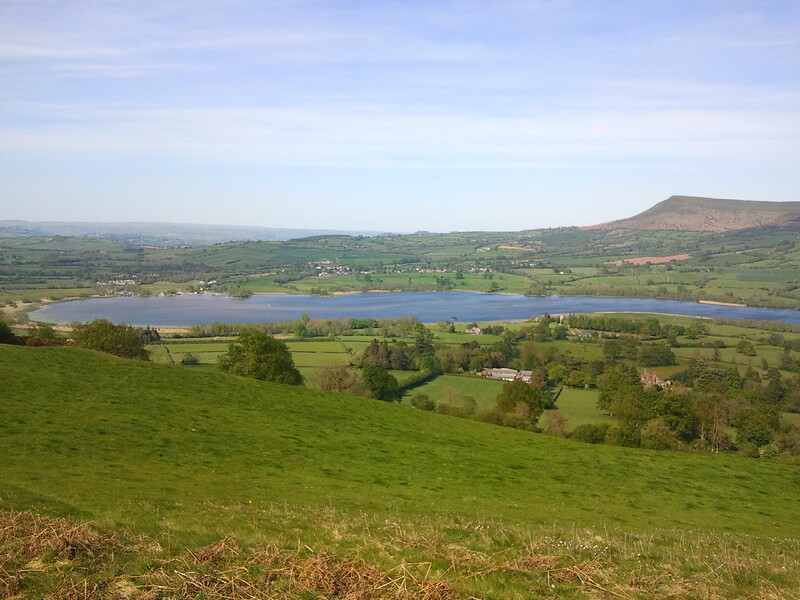 ), continue straight on and as you begin to descend the ridge, look south – westwards and you will be granted superb views of Llangorse lake, with the central peaks of the Brecon Beacons brooding in the far distance. Descend the precipitous slope of Cockit Hill and Mynydd Troed looms large on the other side, reaching the tarmac road at the bottom. Save Mynydd Troed for another day, turn left and follow tarmac road down into Llangorse village. If in need of liquid refreshments, there are a couple of fine pubs that you will pass, The Castle Inn (before the church) and The Red Lion (opposite the church). The path continues opposite the church, cross the road and go through a gate between a house and stone wall. Cross the stile and follow the path through fields, via two gates, reaching a footbridge crossing a stream. Head across next field reaching a stile, whereby you will arrive at Llangorse common and the lake. This is an excellent spot for a pinic, but can get busy in the summer months. Head westwards and just up from the picnic area, you should see a footbridge spanning the River Llynfi. Cross this and follow the obvious path across fields, with the lake always towards your left. At track junction, ignore path upwards towards Ty Mawr farmhouse and head straight on, crossing Llangasty Nature reserve, along a board walk, some more kissing gates, before you reach an open field with Llangasty Church straight ahead. This is a delightful place in which to take a breather, especially on a hot day. There are usually some pebbles next to the font, so that pilgrims and visitors can make prayers. Leaving the church, head up the road and turn right at junction. Shortly afterwards (5 mins), you will reach Llangasty Village Hall. Turn left here and you will see a bridleway with information board. This will take you up on Allt y Esgair (the second main climb of the day). Head up between the hedges, the path takes you up to the start of the ridge, turn left at the junction. You will come to a choice of paths after heading through a gate, it doesn’t matter which you take, except that the one on the right will can be less muddy as main one is used by pony-trekkers. Whichever path you take, you will follow the ridge which takes you to the summit of Allt y Esgair. This is the site of an Iron Age fort. Allow plenty of time to marvel at the stunning 360 degree panoramic views. Looking down below to the west, you will see the River Usk snaking its merry path in the valley. As the sun dips westwards this is a sparkling sight to behold. There is an information board highlighting the various peaks of the Black Mountains in the East. Having savoured these magnificent views, the descent is relatively easy. Follow the path down through a gate and then down between hedges (ignoring a path to the right), until you reach a road. If you have time, you could always visit the award-winning Welsh Venison Centre, head up towards Middlewood Farm. Otherwise, turn right and shortly reach the A40. Turn left and follow the road (watching out for vehicles that can whizz past you) before shortly reaching a pavement and taking you back up through Bwlch Pass to your starting point. The New Inn, opposite The Star Bunkhouse, is an excellent spot for a well-earned pint! 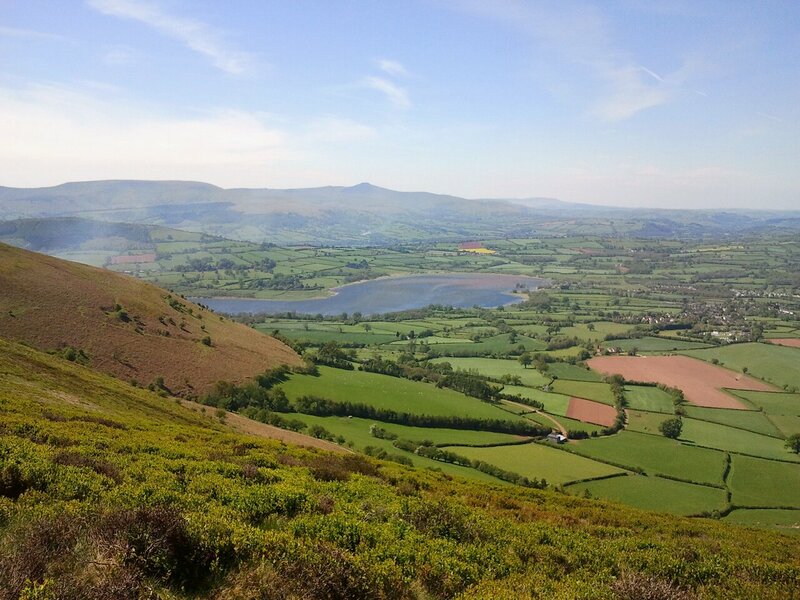 This entry was posted in Walking, Walking Wednesday and tagged brecon beacons, Bwlch, children, countryside, days out, hiking, lake, Llangorse, tourism, Walk Wednesday, walking. Bookmark the permalink.